We can best understand what worship is when we look at the gospel record of John, where Jesus has encountered the woman at the well. We read, "So He came to a city of Samaria which is called Sychar, near the plot of ground that Jacob gave to his son Joseph...Jesus answered and said to her, “If you knew the gift of God, and who it is who says to you, ‘Give Me a drink,’ you would have asked Him, and He would have given you living water...The woman said to Him, “Sir, I perceive that You are a prophet. Our fathers worshiped on this mountain, and you Jews say that in Jerusalem is the place where one ought to worship" (John 4:5, 10, 19, New King James). 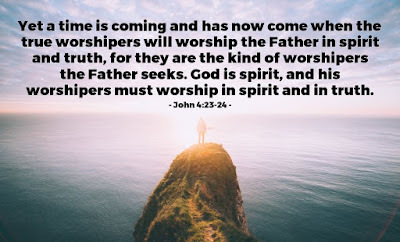 And yet it's the response Jesus gives her that tells us worship is done in spirit as well as in the utmost of honesty: "Jesus said to her, “Woman, believe Me, the hour is coming when you will neither on this mountain, nor in Jerusalem, worship the Father. You worship what you do not know; we know what we worship, for salvation is of the Jews. But the hour is coming, and now is, when the true worshipers will worship the Father in spirit and truth; for the Father is seeking such to worship Him. God is Spirit, and those who worship Him must worship in spirit and truth" (John 4:21-24). So how do we get here from Ezekiel 46? When we look at the verses in this chapter we find something rather interesting. So, let's read this: "‘Thus says the Lord God: “The gateway of the inner court that faces toward the east shall be shut the six working days; but on the Sabbath it shall be opened, and on the day of the New Moon it shall be opened. 2 The prince shall enter by way of the vestibule of the gateway from the outside, and stand by the gatepost. The priests shall prepare his burnt offering and his peace offerings. He shall worship at the threshold of the gate. Then he shall go out, but the gate shall not be shut until evening...Thus they shall prepare the lamb, the grain offering, and the oil, as a regular burnt offering every morning" (Ezekiel 46:1-15). because I provide water in the wilderness, and rivers in the desert, to give drink to My chosen people. The people I formed for Myself will declare My praise" (Isaiah 43:19-21, Holman Christian Standard). In other words the worship order God desires from His people of Israel is that they are to see His magnificence; His wonder, and marvel in the expression of His love for them. For when we see His lavish love poured out on His people we see a people that are ready to praise Him for His goodness and kindness. What then is justice if it's not God's goodness expressed between His people to others around the world? This is then what Jesus had in mind when He told the disciples, "It is not for you to know times or seasons that the Father has fixed by His own authority. But you will receive power when the Holy Spirit comes upon you, and you will be My witnesses in Jerusalem, and in all Judea and Samaria, and to the ends of the earth" (Acts 1:7-8, Berean Study). So our act of praise and worship is indeed come from the Jews, with the first of the Christians being Jewish and the rest of mankind being blessed by Jesus Christ, the Son of the Most High God, and then His disciples, His Jewish followers. May we also be that same example when it comes to praise and worship of the God who liberated Israel from sin and death. While it is always in my heart to prepare and extend kind words to you all, I do sometimes struggle with what I read. On the other hand I pray, as usual, everything I write is for your benefit in the grace and glory of Jesus Christ. It is in His name I send this message to you. Amen.